The development kit makes it easy to integrate the VCMA9 to the customers system. All interfaces of the VCMA9 are directly accessible. Cables and software are included. The ABC-11-Kit consists of VCMA9 module, VCMA9-Baseboard for easy connectivity, power supply with power cord, Ethernet and serial cable for communication with a host. Additionally, ABC-12 includes a 6.4" color display (VGA TFT) with touchscreen. ABC-11 is open frame, ABC-12 is built in a metal case. Other development kits are possible on request. 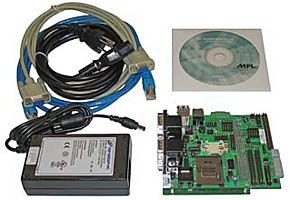 Complete developer kit consisting of VCMA9-55, VCMA9-BB2, power supply & power cord, serial and Ethernet cable and SW-BSP (either Linux or Windows CE.NET). Including HW and SW support. 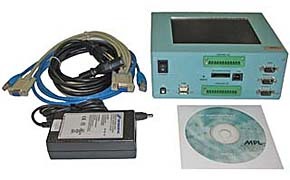 Complete developer kit consisting of VCMA9-55, VCMA9-BB2, TFT-display (VGA) with touchscreen, power supply & power cord, serial and Ethernet cable and SW-BSP (either Linux or Windows CE.NET). Including HW and SW support.